A drama about politics is nothing new if one thinks of similar movies like Nixon (1995) or Primary Colors (1998). But what is this movie telling us if anything? As a run-up to the 2012 elections in the United States, it is a reminder that while politics is supposed to be about doing what's good for the people, there are many aspects of politics which represent all that is horrible about humanity. Lying, cheating and backstabbing are all par for the game and should never be in any way unexpected as anybody claws their way to the top. If anything, it underlines how anybody can start out with the noblest of goals but somehow the political process itself corrupts any and all who get involved with it. The movie is an adaptation of the 2008 stage play Farragut North which was supposedly based on the 2004 Democratic primary campaign of Howard Dean. George Clooney plays Mike Morris, a Democratic presidential candidate. Snippets of Morris's speeches are great sound bites showing noble ideals. This is the type of guy you could vote for. However, what's going on behind the scenes by the various supporting players who work on the campaign show the underhanded side of politics. After all, politics isn't about global warming or unemployment or the economy, no, it's about winning. Who cares about noble ideals? Unless, of course, those ideals get votes. Ryan Gosling plays Stephen Myers, the mastermind behind the Morris campaign and the central character of the film. It is here we see that politics is about winning, whether you're the candidate or you're working for the candidate. It is here that we see that ideals will in the end be sacrificed if they somehow impede one's ability to win. Meyers is out-manoeuvred by the opposite team with an amazing and masterful ruse and Meyers only recourse is throw out his dignity and go for the dirt. 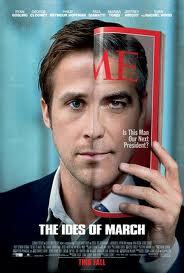 This film has a stellar cast: George Clooney, Ryan Gosling, Philip Seymour Hoffman, and Paul Giamatti, etc. all of whom bring a certain weight to their performances. This is a film about characters, their thoughts and their interactions; there are no car chases here. Considering the date of release, many will be drawing parallels with real life. While the specifics of the story may not match real life incidents, there are many ideas which do reflect the reality of the American political process. Politics can be scary. I'm sure every politician thinks they have the right answer but many times the questions are so complex, even the experts get it wrong. Let's come back to the idea that politics is about winning and every candidate thinks they have the right answer. Now that is scary. This is a good story and a good film with superb acting. I thoroughly enjoyed it and would recommend it. While not exactly exposing revelatory truths, The Ides of March is supremely well-acted drama that moves at a calm, confident clip. The Ides of March is a 2011 American political drama film directed by George Clooney from a screenplay written by the latter, along with Grant Heslov and Beau Willimon. The film is an adaptation of Willimon's 2008 play Farragut North. It stars Ryan Gosling, Clooney, Philip Seymour Hoffman, Paul Giamatti, Marisa Tomei, Jeffrey Wright and Evan Rachel Wood. Farragut North is a 2008 play written by Beau Willimon, loosely based on the 2004 Democratic primary campaign of Howard Dean.